You might remember me saying that I am trying to be more healthy. That I want to lose weight and be fitter? Well this week I’ve been mostly drinking More. I don’t mean drink more like too much and being desperate for a wee, I mean More drinks. It’s a range of flavoured water with added vitamins. It’s certainly an improvement on fizzy pop health wise, and I don’t like tap water. I think I am More’s target audience – I want to be healthier but I’m fussy and don’t want it to taste like a diet item. If it’s flat and boring I won’t be drinking it! These are diet drinks though, as the blue one (get more vitamin A, blackcurrant and blueberry flavour) is just 6 calories with zero sugar for a 500ml bottle. Even Jen likes them and he can be fussy! They cost about £1 to £1.50 depending on the shop and current offers. You can also get kids versions in smaller sport cap bottles called “a little more”. Not that I calorie count now as I am trying SlimPod by Thinking Slimmer to cut down on my weight. I listen to a little motivational podcast each day. It’s an anti-diet, instead of trying to guilt trip me in to eating less and eating boring like diets do it subtly re-programs how you think about food and exercise. I now eat less and sometimes I choose the healthier option without feeling like I’m missing out. It’s weird, but I actually want fresh fruit and veg now. 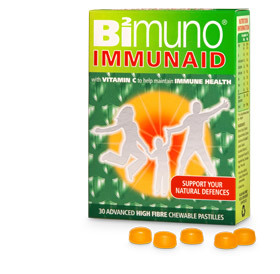 But if you want an even bigger immune system boost try Immunaid by Bimuno. It’s a daily supplement that does the whole prebiotic thingamy whatsit. Yeah, I’m no doctor so I advise you to read up on Bimuno prebiotics yourself. Obviously you should eat healthy and supplements aren’t an excuse to eat junk food all day every day but for folk like me that catch every single germ going it sounds like a good idea. These cost £9.99 for a box of 30 pastilles or 3 boxes for £19.98. I’ve not tried it myself yet, but I intend to. I doubt it would keep me totally sniffle free but a month without some kind of lurgy would be great. As I type this I am under the weather, drowning in snot. Anyone who has me as a buddy on FitBit will know that I have hardly walked anywhere in a few days, that’s because I’ve mostly been asleep. Anyhow if you fancy winning yourself a months trial (30 days) enter now. My competition is open to UK residents over 18 years only. Closing at 23:59 on 22nd of May. Prize is provided by Bimuno, and will be sent by them not Julie’s Notebook. Please allow 28 days for delivery. No automatic/bulk/robotic entry methods allowed. One entry per person. No cash alternative. Winner is picked at random via Rafflecopter. I was given some More Drinks for the purpose of this review, and hopefully some Bimuno will arrive soon. Leave time in your day to relax. Even if it’s just ten minutes, a little me-time goes a long way! Lucy Dorrington recently wrote… Win Philips SHE8000 In-Ear Headphones RRP £25. Lots of water, fresh fruit & Veg! The Diary Of A Jewellery Lover recently wrote… 30 Quick Ways To Save Money On Holiday. 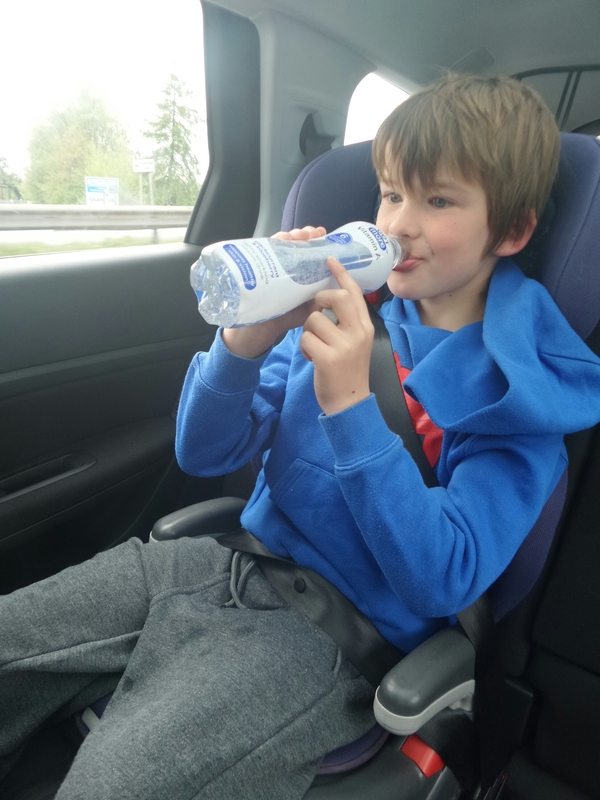 My tip is to drink lots of water as it gives energy especially at 4pm for the mad rush from school, work and teatime. 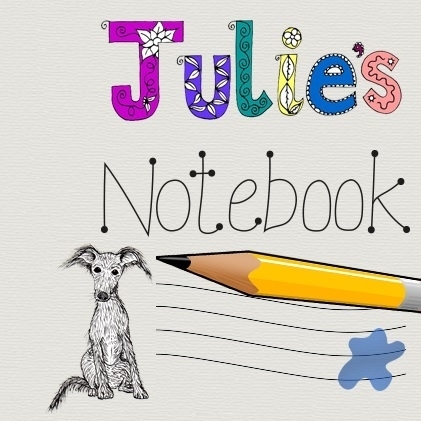 Jo Bryan recently wrote… Freebie Friday 1st May 2015. Eat small meals regularly throughout the day rather than three large meals; and, like others have said, drink plenty water! Get a dog! They are wonderful companions,stress relievers and give unconditional love! They make you exercise every day and you’ll make new friends! Lots of water, fruit, veg and exercise. Keep really hydrated. Dehydration makes people very poorly! Be sure every day to have plenty of water, vegetables and fresh fruit. Keep yourself well hydrated by drinking loads of water. Even when you are tempted to drink a fizzy drink, just substitute it for water. keep active and well hydrated. if only I could follow my own advice!